Do you have lots of business ideas, but haven’t taken any action on them? 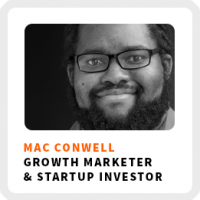 Mac Conwell is loaded with ideas about how to scratch your entrepreneurial itch. He’s journey from startup entrepreneur to startup investor is littered with loads of insights about how you can get started on your business idea. Currently, he’s a fund manager with the Maryland Technology Development Corporation, Mac helps to source, evaluate, and make investments in early-stage startup companies in the state of Maryland. Before investing in startups, he had two startups of his own. One was a crowdfunding platform that he pivoted into digital gifts, giving people the ability to buy a song on iTunes to give to another person. His second startup was an e-commerce startup to enable retailers to sell their products more easily from mobile devices. It failed and he explains why. Why managing your emotions is the most important skill you can learn as an entrepreneur. How to know when to cut your losses when starting a business. How Mac built his network by asking people to meet over a cup of coffee. Why he left his well-paying job early on in his career. Why Mac believes startup entrepreneurs need to spend more time on customer acquisition and less time tinkering around on their idea. Ideal work environment: Around people he trusts, cares about, and has fun working with. Superpower: Having empathy for others. Definition of success: Being rich while changing the world. 90-day goal: Investing in more minority led companies and helping Tedco to grow the entrepreneurial community in Maryland. 2) Know what you’re going for. Accelerators are not all created equally so it’s important to know what you’re looking to gain from the experience and find an accelerator that fits your needs. 3) Before you go to the accelerator, come up with a plan of the things you want to execute during the accelerator process and make a list of the people you want to meet. 4) Have your product ready so that you don’t spend your time in the accelerator working on your product. 5) When applying to an accelerator, network your way in and include your most impressive accomplishments in the first question on the application.